A bishop in Eastern Samar has claimed that many Typhoon Yolanda survivors are gambling, drinking and throwing away the money and fortunes made in aid to the stricken region. Borongan Bishop Crispin Varquez said the results of such findings could be part of the “unhappy realities” from the aid by local and international donors. “For instance, out of the millions or even billions of money that have come into survivors’ hands through different interventions of various institutions or persons, it is observed that only very few families and individuals have properly utilized such financial assistance. “In fact, many families and individuals have used such financial assistance for other deplorable purposes,” the CBCP quoted him as saying. “Gambling, especially cockfighting, both legal and illegal, has registered more occurrences in our communities. Even fishing is on the downswing, with the price of fish in the markets increasing, simply because fewer fishermen go fishing despite having received free fishing boats, fishing nets, and other paraphernalia,” he added. Citing information reaching him, he said sales of beer and alcoholic beverages doubled in calamity-hit communities months after Yolanda and Ruby. Varquez also said he cited a decrease in harvests in farming most likely due to a lack of interest in the matter. The bishop believes that many have adopted a mentality of ‘easy money’ through cash-for-work programs, social welfare programs and a host of other financial assistance initiatives which involved short-term and long-term financial assistance to many. 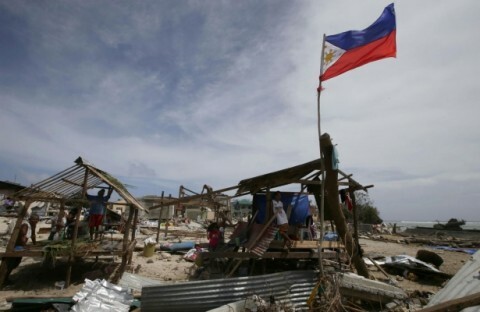 “If this situation does not change, within three to five years after the INGOs (international non-government organizations), NGOs and other institutions shall have left us, the poverty level in our affected areas will likely be worse than before the super typhoons,” he warned. The bishop also stressed that the church and government should work together and teach people the value of hard work and productivity – he also suggested a closer supervision over aid money spending and requested leaders to teach survivors how to be independent. Typhoon Yolanda hit the shores of the Philippines in November of 2013. The storm not only recorded one of the fastest speeds in the history of typhoons around the globe, but it took the lives of 6.300+ people in its path.